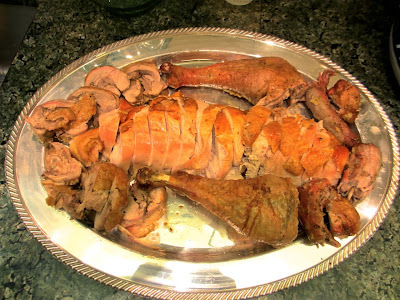 This year I became intrigued by an article in Cooks Illustrated showing how to make a broken-down turkey the way Julia Child set forth in her excellent The Way to Cook, but with some improvements (brining) that the folks at America's Test Kitchen had added. The method is reasonably easy to understand if a little complicated to execute. You take off the leg quarters of the bird, then debone the thighs, season the interior and tie them into little roulades. You take the breast and attached wings off the ribcage and cut away the backbone, too. Brine the breat for 6-10 hours. To cook, take the breast out of the brine, dry it, oil it and bake it skin side down in a non-stick skillet to start browning the skin and cooking the breast. After 30 minutes place the breast skin side up on a baking sheet atop your stuffing, and add the leg/thigh quarters to the pile. (I add the neck and tusch to the pile.) Roast until done, about 60-80 minutes. Carving is a snap. Cut the wings off the breast. Remove the breast meat from the bone and carve perpendicularly. Carve the thigh meat (roulade) and leave the legs whole for those (like myself) who like them. Give the tush to the person who wants it most (J and my sister-in-law, in my case) and distribute neck pieces to those who like it. A nice presentation with wonderfully moist white meat (the holy grail of turkey cooking) and stuffing that benefits from being the flowing juices of the roasting bird. I think this will be my go-to recipe for the foreseeable future.